Off-the-shelf recreational flight controls tend to be a bit more limited in fidelity. While some of these controls use active force feedback, it’s clear that when addressing cost/performance tradeoffs, most designers leaned distinctly toward low cost and chose simple spring-based control loading. It’s certainly not in the same league as the commercial and military systems, though in a few cases it can do surprisingly well. The control forces a pilot experiences depend on the aircraft. Fly-by-wire aircraft like an Airbus or an F-16 isolate the pilot. Stick feel comes solely from the mechanical construction of the side stick controller. Large aircraft with hydraulic servos between the pilot and the flight control surfaces (B737, etc.) allow the pilot to feel a small portion of the true aerodynamic forces. Smaller, fixed-wing aircraft without servo assistance rely on the strength of the pilot’s arms and legs to move the control surfaces. The pilot pushes on the controls and feels the air pushing back. In the case of fly-by-wire, using spring control loading can be a very good choice. Choose the proper strength spring, perhaps add a little dampening, and you’ve got realistic stick feel. Move on to a heavy with hydraulically assisted flight controls and you start to lose a bit of that fidelity. The scaled down aerodynamic forces which are felt in the flight controls are different in different portions of the flight. Spring characteristics stay constant and won’t reflect those changes. When using simple spring control loading for non-servo aircraft simulators, we lose a lot. The best we can do is pick springs which approximate the most frequently felt control forces. This is… “okay”. Or maybe not, depending on your personal desires. The control feel in a non servo-assisted aircraft consists of the aerodynamics forces on the control surfaces, the friction of bearings and of cables passing through fairleads, the inertia of controls, linkages, and surfaces, as well as, any elasticity, looseness, or damage in the system. An active control loading system with its sensors, processors, and motors can model all of this and more. By comparison, spring control loading is clearly in second place. However, it needn’t be a distant second place. Aerodynamic forces are the largest component of control feel; at least they are in a well maintained, undamaged fixed-wing aircraft. A key point is that aerodynamic forces change with airspeed. The controls feel quite stiff at high airspeed, and mushy, easier to move at low airspeed. The greatest shortcoming of simple spring-based control loading is that it produces the same control feel regardless of airspeed. If a spring based system could be continually adjusted in response to changing airspeed, it would become a great deal more realistic. A typical off-the-shelf set of recreational flight controls use some variation of the following arrangement. There may be cams and followers, compression or extension springs, but behind the buttons and colorful labels, each axis has a basic spring system which progressively resists movement. One variation uses a pair of extension springs per axis. Each spring is tensioned enough so it can’t go slack regardless of how far the control is moved. Increasing or decreasing the tension on one of the springs will shift the “hands off” position of the control. This is a nice trim function for flight controls. Changing the tension on both springs might seem to change the force required to move the control, and thereby provide the means to dynamically adjust the control loading. Unfortunately, it just doesn’t work that way. Springs are defined by their spring constant. Yes, there’s length and diameter and wire size and so on, but springs are fundamentally about springiness, and the fundamental springiness parameter is “K”, the spring constant. K is expressed in force per unit length. For example, 5 pounds per inch. A spring with this spring constant would take 5 pounds to change its length by an inch, or 50 pounds to change length by 10 inches, or half a pound to cause a tenth inch change. You get the idea. It’s linear, at least as long as you don’t stretch or compress the spring enough to permanently deform it. So, back to our two spring control loading and proof that more tension doesn’t make the control harder to move. Imagine that the two springs (with K = 5 lb/in) have each been tensioned to 20 pounds. The spring forces offset each other, and the control stick is centered. Now imagine that the stick is moved to the right so that the point where the springs connect to the stick moves an inch. The extra inch stretch on the left spring increases its tension by 5 pounds to a total of 25. The right spring has been relaxed by an inch so its tension has been reduced by 5 pounds to 15. We’ve got 25 pounds pulling to the left and 15 pulling to the right for a net of 10 pounds to the left. Remember that number. Let’s double the spring tension. With the control stick centered, we now have 40 pounds pulling to the left and 40 to the right. Moving the stick as before adds an inch to the length and 5 pounds to the tension of the left spring while shortening the right spring by an inch and reducing its tension by 5 pounds. We have 45 pounds pulling to the left and 35 pulling to the right resulting in a net 10 pound pull to the left, exactly as before. Changing the initial tension in the springs does not alter the force needed to move the control. It’s K, the spring constant, which determines how hard the control is to move. We can’t change K on the fly. But we can change where the springs connect to the stick. The stick is a lever. If we change where springs attach to the stick, we change the leverage, and the amount of force required at the stick grip changes. 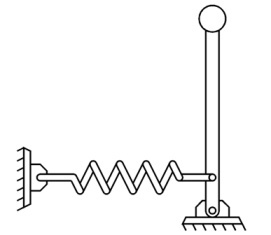 We might, for example, use a motorized lead screw to move the spring attachment point up and down the stick. With the spring attachment point closer to the stick pivot, the stick is easier to move. Move the connection point higher and the stick forces increase. 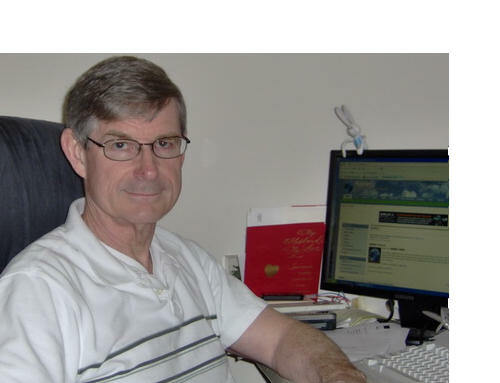 Several years ago a hobbyist experimented with this approach. He found the vibrations from the lead screw motor to be a distraction, but otherwise the approached worked well. Here’s another approach, one that doesn’t require a motor so close to the control grip. At first glance this may appear to be simply another variation on the same theme, but there is a profound difference. While the above examples rely on increasing spring stretch to provide increasing control force, this approach relies on the changing alignment between the spring force and the spring attachment arm. Yes, the spring will still stretch with stick movement, but only a bit and the spring force will remain roughly the same. 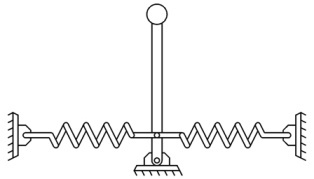 With the stick in the vertical position, the attachment arm is in line with the spring. All of the spring force is transmitted to the stick pivot point. No force is felt at the grip end of the stick. As the stick is moved, the attachment arm rotates out of alignment with the spring force. A fraction of the spring force acts to bring the attachment arm back into alignment. The larger the stick movement, the greater the force acting to move the stick back to vertical. A nice feature of this arrangement is that if the spring is at least several times longer than the attachment arm the force felt at the grip is nearly proportional to stick angle. At a 15 degree stick angle about a quarter of the spring force will be pulling the stick toward vertical. At 30 degrees that restoring force grows to about half the spring force. This proportionality holds up to about +/- 40 degrees. So what sets the spring force? Well, that’s the initial tension on the spring. That’s set by where we place the “stationary” end of the spring. If we were to connect the spring to a travelling nut on a motor operated lead screw, we could change the control feel on the fly. Since the motor is on the other side of the spring from the stick, it’s less likely to cause distracting vibrations. This can be built with one or two springs per control axis. The advantage of two springs is a great reduction in the lateral force placed on the stick pivot point. All of these spring control loading arrangements can be used in home simulators. Designs based on them may become too large to fit conveniently within the control column. You may find it necessary to locate the control loading system away from the flight controls and connect them with cables. It’ll add a touch more realism.